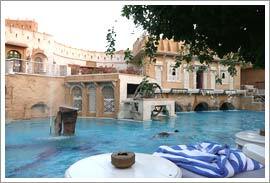 Ajit Bhawan - one of the most impressive heritage hotel established in the beautiful city of Jodhpur,Rajasthan. The hotel is as charming as the erstwhile Rajputs. It was once the residence of Maharaja Ajit Singhji of Jodhpur. It was built especially for him. Some part of this heritage hotel is still inhabited by the members of the royal family. During your stay at the hotel, you can see the members of the royal family in person and get yourself acquainted with the history of Jodhpur. The hotel is located at a distance of 3 kms from the airport. Ajit Bhawan Palace heritage hotel gives you an opportunity to experience the regal life style of the Maharajas as the members of the Maharaja's family are there to treat you like their own special guest. The traditional decor of the hotel coupled with state- of -the- art facilities makes your stay at the hotel a memorable experience. Ajit Bhawan Palace has 50 guest rooms - one single suite, 11 luxury suites and 38 deluxe rooms. All the rooms are well furnished and have great facilities. The hotel has a lush green garden dotted with several beautiful villas. Here you can roam around and enjoy the serenity of nature. The multi-cuisine restaurant at the hotel gives you an opportunity to gorge on a variety of dishes especially the Rajasthani ones. The much needed facilities provided at the hotel are travel assistance, currency exchange, car on rent, safe deposit locker, vehicle parking, doctor on call, laundry/dry-clean and shopping arcade. Business travelers can carry out their meetings in the well equipped conference hall without any hassles. Banquets are also up to the mark. To enjoy the bliss of recreational activities, you can go for a swim or a relaxing massage done by experts. And the idea of going around the village in a car is yet another interesting option. In fact, this is the most exciting activity as this will offer you a chance to enjoy the dream ride in the Vintage cars provided by Ajit Bhawan Heritage Hotel.